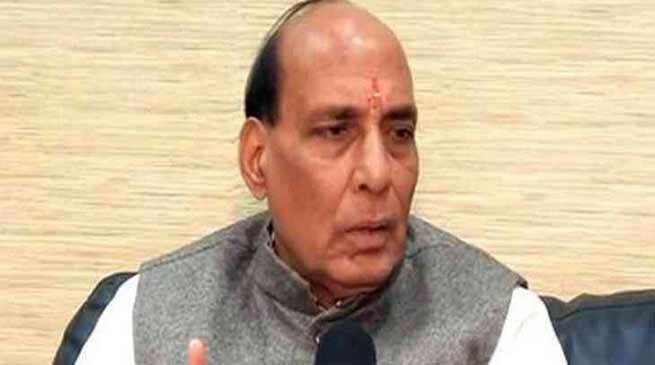 Union Home Minister, Rajnath Singh has asked the Government of Mizoram to take all steps to defuse the escalating tensions on the Assam-Mizoram border and prevent the assembly of people at Bairabi. In a letter to Chief Minister, Mizoram, Lal Thanhawla today, Union Home Minister Singh urged him to prevent the asssembly of people at Bairabi as a step towards defusing the situation. Singh also urged the State Governments of Mizoram and Assam to take all possible measures to maintain peace and public order. “The outstanding issues need to be resolved mutually and amicably,” Singh told Lal Thanhawla. The Union Home Minister said he had directed the Union Home Secretary to convene a Chief Secretary level meeting of the two States in the next week. Singh said, if necessary, thereafter there can be a meeting of Chief Ministers of the two States. It may be mentioned that Assam Chief Minister Sarbananda Sonowal had sought the Home Ministry’s intervention and had a telephonic talk with his Mizoram counterpart to resolve the border row amicably. The Hailakandi district administration says following the Union Home Minister’s conmunique, the administration on other side of the border must take up immediate steps to defuse the situation by not allowing the people to assemble. “The ball is now in their court and the onus lies with them to normalize the situation,” said a police official of Jamira outpost close to the interstate border. The administration is closely monitoring the situation and is geared up to tackle any situation following reports that Mizo Zirlai Pawl and other organisations from Mizoram would make yet another attempt to intrude into Assam’s territory and construct a resting shed on Wednesday. Security has been tightened along the Assam-Mizoram border with Deputy Commissioner, Hailakandi, Adil Khan closely monitoring the situation on the border front with Superintendent of Police, Mohneesh Mishra and other senior officials of civil and police administrations. The administration is also holding series of meetings in the bordering areas to instill security and confidence among the people as part of its confidence building exercise.